April seemed to take a page out of March’s book by coming in like a lion, but we think it is safe to say the sheep transformation is permanent. As we see more sunny days and green grass sprouting along with leaves and flowers, our excitement for spending time outdoors and gardening increases. So this week we are putting the Spotlight on some of our gardening and outdoor decor, so you can amp up your own excitement for spending time and decorating outside of the house. Just like your front door or entryway in your home, your outdoor or garden space should be welcoming and comforting. 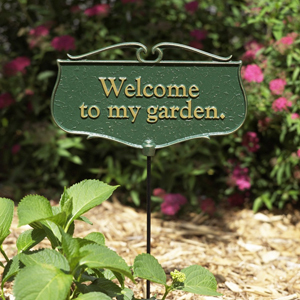 Our Welcome to my Garden Sign adds a contemporary feel among shrubbery and your favorite blooms, while still complementing the natural environment with its green finish and rustic gold lettering. And, don’t be worried about leaving it out in the rain; its all-weather coating will protect it from many of nature’s elements. 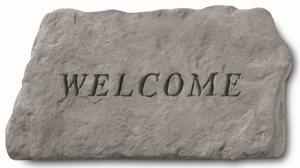 If you’re looking for something with more of a natural feel, our Welcome Engraved Stone is a great option. It is large enough to be seen by any garden visitor, yet will fit right in among your colorful flowers and greenery. It is also weatherproof, so it can be placed in just about any space. In addition to our welcoming outdoor decor, we offer many decorative and functional pieces to complete your backyard. 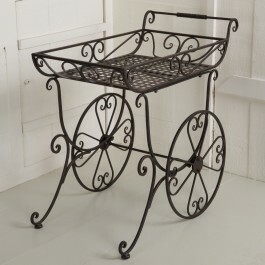 Our Garden Cart features scrolled iron heart designs and wheels that turn for heightened functionality. This Cart looks beautiful among wildflowers and greenery, but will also assist you in transporting flowers or gardening tools if necessary. 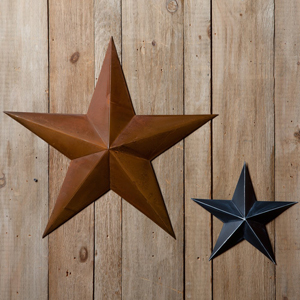 If the metallic style is your thing, we also offer these Rustic Metal Stars, perfect for mounting on the side of your house or near potted plants on a porch for extra flair. 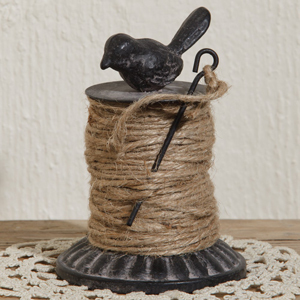 If you are working on a flower bed and want to make sure the rows are straight, try using our Bird Twine Holder, featuring a cute cast metal bird to watch over the twine. The guide line pin will make it easier to perfect your flower bed, and the twine is included so you can start gardening at your convenience. 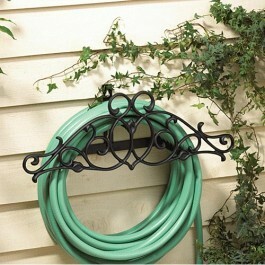 Finally, we know you’ll be prepared to water your flowers and plants with a garden hose, but instead of fighting to keep it tidy afterwards, our Tendril Hose Holder is a great solution. Just simply wrap the hose around and unwrap it neatly the next time you use it. The Holder features a decorative design and a weather resistant finish, so it will look nice for months and years to come. Looking for something else or need more inspiration for your own design? Check out our full selection of garden and outdoor items to get to enjoying the great outdoors! This entry was posted on Wednesday, April 15th, 2015 at 1:52 pm	and is filed under Americana, Decorating, Outdoor, Seasonal Decorating. You can follow any responses to this entry through the RSS 2.0 feed. You can leave a response, or trackback from your own site.